Brace yourself (and your home) for the frigid winter temperatures before they arrive. To do this, consider installing a furnace from Swanton Energy Services. Designed to fire up your home’s warmth without burning through your budget, this powerful heating system will land you the cozier nest you crave and the serious savings you deserve. With a furnace, total comfort, energy efficiency and budget-friendly operation go hand-in-hand—or as we say it, wing-in-wing. But a furnace does more than radiate warmth. It plays a vital role in circulating your home’s air to keep it fresh, too. Why is this important? Because fresh air is easier to heat than stale air, which means your furnace is able to heat your home in a more energy-efficient manner. This fosters a more comfortable space and lower energy bills. Furnaces are built to last. But they’re not indestructible. And, unfortunately, if your furnace’s operation takes a nosedive, it’ll take your comfort down with it. That’s why you need Swanton on your side. From delivering flawless furnace installations to carrying out thorough system inspections, our furnace services will get your unit’s health in the proper pecking order—and keep it that way. This, in turn, will certify that your comfort always remains on course. Keep in mind it’s important for you to keep a bird’s eye view on your furnace’s performance. From strange noises to cold pockets, no problem should be ignored. Doing so will result in what should have been an easy fix escalating into a costly disaster. So, if you notice your furnace acting abnormally, hoot for help immediately. Our team will swoop in to help quickly, diagnose the problem and swiftly perform the repair your furnace needs. Find yourself perched on a higher branch of comfort by filling out our online form or calling Swanton at 732-335-6731 today! An oil furnace converts oil to heat to safely fire up a warmer home. This unit provides more heat per BTU than other heating sources and requires a tank to store the oil that must be delivered. Plus, we guarantee that, when you choose an oil furnace from one of our trusted brands, you’ll receive a reliable unit that surpasses your expectations with its top-of-the-line performance and ultra-quiet operation. A gas furnace uses natural gas to efficiently heat your home in a budget-friendly manner. In fact, this unit is known for its high heating efficiency, low fuel costs and its quiet and clean operation. Check out our gas furnaces below. Ready to take your comfort further than it’s ever been before? 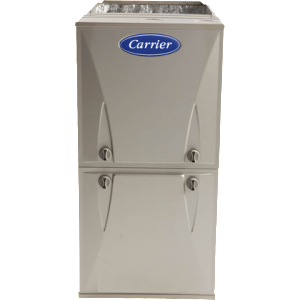 Discover the following Infinity® Series gas furnaces from Carrier. These units combine high-efficiency operation with reliable performance for the ultimate comfort experience. It’s truly a difference you can feel. The following Performance™ Series gas furnaces from Carrier deliver the powerful performance you need to meet—and then exceed—your comfort demands. But that’s not all. These units are efficient, quiet, flexible, durable and guaranteed to keep you cozy all winter long. If you’re searching for a gas furnace that delivers superior efficiency, yet remains within your budget, then look no further than the following Comfort™ Series gas furnaces from Carrier. These high-efficiency units will elevate your comfort without escalating your energy bills.